For the most part, revival properties - GI Joe, Transformers, He-Man - focus on the old characters and ignore the new. That's the inherant flaw in marketing to nostalgia: even if you manage to draw in new fans, how can they hope to develop a fondness for characters who get passed over for toys in favor of cheapass repaints? Surprisingly, GI Joe has a track record of avoiding that by including the new with the old. Sgt. Hacker was a computer specialist at Fort Leonard Wood repairing the mainframes that handle the personnel records when he heard that the GI Joe Team was looking for an information retrieval specialist. He immediately hacked into the Pentagon computer system and put his own name at the top of the candidate list. When he was hauled in front of General Tomahawk and asked how he thought such a clumsy attempt would make him look good, he replied that what he did was only to get their attention. Then Sgt. Hacker laid a disk on the table that contained the general's high school records including copies of detention slips. Much of the Cobra central computing system is hidden within a top-secret base with no external access. To hack the Cobra system, Sgt. Hacker has to physically get inside the secured base, and the surest and most dangerous way is by posing as a Cobra trooper. It is believed that on one of his raids into Cobra territory he had a hand-to-hand encounter with Cobra medic Scalpel and got the better of him. Interestingly, that whole thing about sneaking onto Cobra Island to hack the computers directly? It became a plot point in the DDP comics, but featured Barrel Roll as the man in the action, with Hacker (and also Firewall and Mainframe) providing tech support back at the pit. Hacker was built with a totally new body, and it was apparently never re-used. If you're even remotely familiar with GI Joe, you know what an oddity that is. He's wearing a gray uniform with grey boots, kneepads, gloves and webgear. For a guy who works with computers, he's sure loaded down with weapons, including a knife and a hand saw strapped to his chest. And carabiners? Who taught him to use a computer, Ethan Hunt? There are various pseudo-techy elements dotted around, such as the blue panel on his leg that has a cord bundled next to it, or the... portable camcorder (?) strapped to his right arm. In the artwork, Hacker wore glasses, because you can't be a computer enthusiast unless you have bad eyesight. That made him only the second Joe to wear corrective lenses (after Short-Fuze), but the toy's face is bare. Maybe he wears contacts when he's in the field? Because it'd be a shame if Hasbro deprived burgeoning little four-eyes everywhere of a role model. 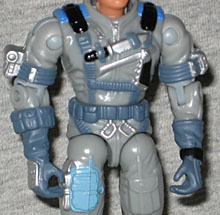 Of course, like most Generation 2 Joes, his proportions are really screwed up - the poor guy has no neck! If you'll recall, the point of "SpyTroops" was dressing people in disguise. Like the filecard suggests, in this set, Hacker is the one with extra clothes to wear. Apparently he's supposed to be dressed as Firefly, which is bad news for him, because Firefly never wore anything like this, not even in G2. His outfit comprises a tactical vest with a Cobra logo on the chest, a ridiculous ski mask with built-in goggles, and Cobra shin guards. He may not look like Firefly, but he does look like some generic Cobra SWAT trooper, so at least he has that going for him. The more normal accessories include a grappling hook, a brown submachine gun, and a "Sound Attack" uzi. Sometimes it's nice to dig out these old toys just to remind yourself how terrible those things were and how good we have it now. Stupid Giant Gun? Yes please! Sgt. Hacker must infiltrate a secret Cobra base deep in the Amazon jungle, in order to hack into their mainframe and download the latest codes for the spy satellite network. Sgt. Hacker is goingto use his SpyTroops disguise to get behind enemy lines alone and undetected. Firefly is one of the most feared of all Cobra operatives, especially within the Cobra rank and file. Common troops and officers know to steer clear, or risk getting laid up in the Cobra infirmary for the smallest sign of disrespect. This is why Sgt. Hacker has chosen to infiltrate the base disguised as Firefly. He moves stealthily and quickly to the computer room, and the mission is a piece of cake until Sgt. Hacker encounters Scalpel, the Cobra medic. Scalpel enjoys the business that Firefly sends his way. Will he detect the impostor and raise the alarm? Mmmmmmaybe? No, probably not. The Joes always win. Scalpel received his medical degree through the mail from a small college that advertised in the back of a magazine. His practical experience came from working as an assistant to a doctor in an illegal clinic that treated wounded gang members and other criminals. He joined Cobra not only for the money, but also for the chance to work on exotic injuries and wounds. His patients have a very high survival rate, but none of them would give Scalpel points for bedside manner. As a matter of fact, there have been several complaints about "that nervous little giggle he has when he's working." Unlike most conventional medics, Scalpel does not object to picking up a weapon and joining in the fight as long as it looks like his side is going to win. As far as he is concerned, it just means more patients for him, and he is above all else, a man who enjoys his work. Scalpel harbors a personal grudge against GI Joe Sgt. Hacker for reasons he refuses to reveal. 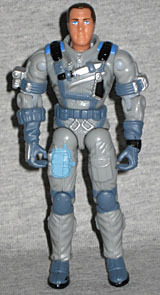 It seems hard to believe that until 2003, Cobra didn't have anyone equivalent to Doc or Lifeline. Scalpel is also one of the only Cobra agents to get a full, real name: Dr. Andrew R. Walker. You know, things like this are the reason filecards have to say they don't refer to any known person, living or dead. 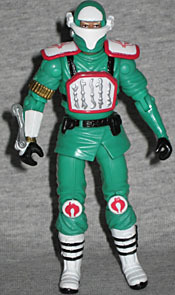 Scalpel is wearing surgical scrubs, with some Cobra-approved modifications: he's wearing heavy white boots, Cobra kneepads, and what looks like a band of brass bullets around his right bicep. There's a white panel with red trim strapped to his chest; on it, five silver medical tools. There's a white bracer on his right arm, with a sliver flip-out surgical saw. 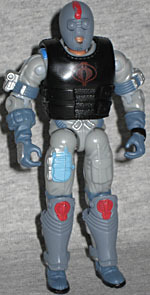 He has removable red shoulderpads, with white panels and red Cobra logos. Two silver hooks stick out of the back of the pads. 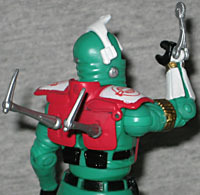 Scalpel wears a green hood with a T-shaped cutout for his face and a white mask that can raise or lower as you desire. There are a few silver elements on the outside of the hood, and the entire thing can be removed, revealing the face beneath. Scalpel has a scar running over his right eye, which is especially funny when you realize this head was also used for the 2003 version of Tomax and Xamot. Of course, neither of them have his platinum blonde hair. In addition to the wrist-saw and the backpack with the hooks, Scalpel's only accessories are a knife and an AK-47, both cast in brown. His entire body (with a new head) was reused in 2005 to create the Medi-Vipers, though those guys came with a different gun. Both Hacker and Scalpel were new creations for the toyline, and both eventually made it into the comics, as well. With GI Joe, at least, Hasbro has never been content to rest on their laurels, injecting new blood every so often. Even Generation 3, the era that started as nothing but retro throwbacks, quickly got in on the "new character" racket. Other toylines could take notes.